It is good to see the shield plug, presence of which should indicate that the Reactor 3 explosion was probably not nuclear as many people have postulated. TEPCO has been clearing the debris from the Reactor 3 operating floor since September 2012, in preparation of debris removal from the Spent Fuel Pool. Then in December 2013, with hardly any fanfare or press coverage, TEPCO started removing the debris, starting with the small pieces, from the Spent Fuel Pool, using remote-control heavy equipment (see my 1/1/2014 post). If the SFP debris removal is on schedule (which may not be, because of the heavy snow in the past two weeks), TEPCO should be just about ready to remove the Fuel Handling Machine. The video was taken on January 31, 2014 from a camera fitted on the boom of a crane. In the latest photo, the shield plug appears intact, but if you look closely the center of the middle piece is depressed downward. TEPCO's analysis is that some heavy debris fell on top of the piece after the explosion, and the shield plug itself (which has three layers) is structurally sound. 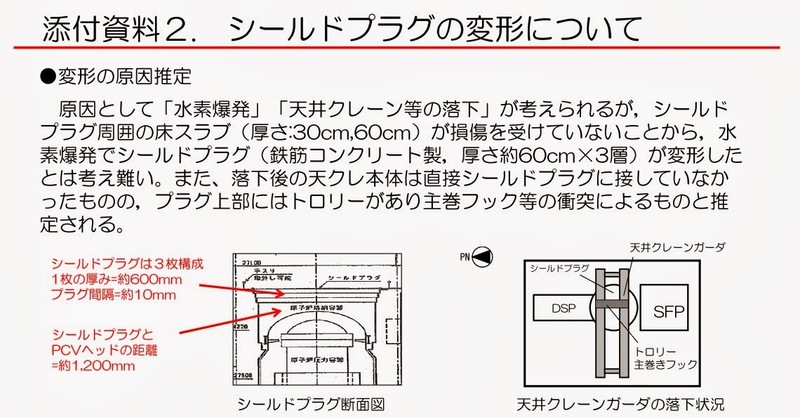 The shield plug is not likely to be touching the Containment Vessel head, says TEPCO in the accompanying document. The cause of deformation could be "hydrogen explosion" or "falling of the ceiling crane and other objects". However, as the floor slab (30-centimeter and 60-centimeter thick) surrounding the shield plug is not damaged, it is not likely that the shield plug (made of three layers of ferroconcrete (60 centimeters each) was deformed by the hydrogen explosion. The ceiling crane itself did not make direct contact with the shield plug after it fell, but there was a trolley above the shield plug. So the deformation is likely to have been caused by the fall of the main hoisting hook onto the shield plug. The first diagram shows (on the left) that there is a 1,200 millimeter (1.2 meter) gap between the bottom of the third layer of the shield plug and the Primary Containment Vessel head. TEPCO doesn't seem to think the mid and bottom layers were damaged and causing damage to the Containment Vessel, and cites the results of dust sampling and air dose rate measurements on the shield plug and surrounding area as evidence (no significant difference in radioactivity). 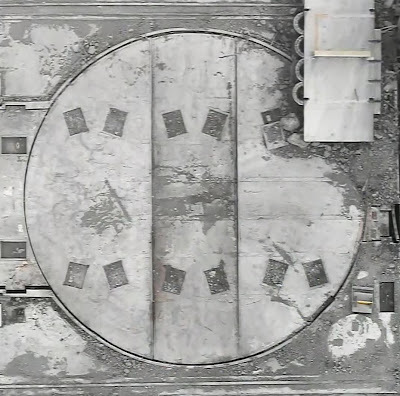 The most severe damage, on concrete floor at least, is not seen near the shield plug or the Spent Fuel Pool on the east half of the operating floor but in the northwest corner (bottom left in the overall photo, or in the video showing the entire floor in the beginning). I wonder what was there (or the floor below). For the changing look of the Reactor 3 operating floor, see my post on 12/31/2013. Photos of cap intact are fakes. Look at the dark line separating the cap from the opening. It's too dark and if it were real it would be full of debris. Look at the extreme sharpness of the opening back to the machinery pool. It's the only sharp thing in the entire photo. It's also not consistent with previous photos released. Look at the edits to the device that is covering the upper right of the reactor opening. See how the top of that device is pixellated - indicating heavy photoshop work. The actual device has some piping on top of it that they have forgotten to edit back in after they edited the photo. 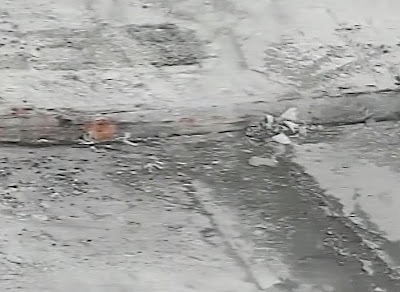 More garbage from Tepco - they can't tell us the core blew in the explosion on march 14th 2011. In the composite photo note the yellow-handled "trays" in the upper right. Are they measuring devices? One has an arm that extends out over the large opening to the Fuel Pool below. Keep in mind the plug weighs 100 tons, HEAVILY reinforced with steel: "TEPCO's analysis is that some heavy debris fell on top of the piece after the explosion". "The most severe damage, on concrete floor at least, is not seen near the shield plug or the Spent Fuel Pool on the east half of the operating floor but in the northwest corner (bottom left in the overall photo,"
Does that correspond to the initial flash of the explosion? What direction did the initial emanate to? I am ever distrustful of TEPCO. Do you remember the picture of building 4 where there was a hole in the wall they edited out with pixelization? A main hoisting hook that can deform a heavily-reinforced 100 ton concrete plug? The U-boat pens never experienced significant damage. Tepco have already been proven to be inveterate liars. R3 blew up and scattered hot fuel over a wide area. Th mechanism of th explosion doesn't matter - the end result is the same. The only thing we do know for sure is that things are going to get A LOT WORSE for a LONG, LONG TIME, (decades), before things get better. Japan will become a global pariah before this is all over. You need to get up to speed with the power of modern day nuclear warfare. Elsewhere, the large box contraption (upper right edge of shield plug) in the overall working floor pic, is sitting over something very sinister. If you look at pics before debris removal and compare the area, the roof trusses are very discolored over that same area. If I remember correctly, there are pics of temporary plating covering some of Unit 3's pool while de-construction was taking place to protect from further debris falling in and where the box contraption is placed now, also had a plate(s) covering that area as some in progress work pics show a huge hole there before being cover with temporary plating and now again hidden from view box contraption. That section of the shield plug doesn't look in to good of shape may not even be there. Not sure what piping/plumbing is connected in that area of the reactor or in the floors below that could be such a failure point to blow out concrete and part of the shield plug. The SFP side supporting concrete wall is a couple feet thick but the radius of the shield plug leaves an area in question where the thick pool walls end and the primary containment wall starts. Notice the equipment pool appears dry (not holding water). Under normal construction or demolition conditions, some guy with a fire hose is wetting the area down to keep dust clouds to a minimum. Guess TEPCO couldn't do that because the runoff would have been another bone radioactive contention so they let radioactive dust and debris go airborne and downplay worker's exposures around the site or completely ignore it or not report it. The yellow handled "trays" look to be some kind of robotic arm or pump or probe with an arm extending out over the SFP water and a set of wires or hoses hanging over the side of the building. There's also one that looks like a carpenters toolbox as well as a couple other tool platforms of some type. They put a semi permanent cooling system in for the SFP during the couple months after the explosion - these could be a replacement for that, or something else. I just re-reviewed several previously released photos, which shows there are significant inconsistencies between these new ones and those previous photos. The most telling photos of all were taken on March 20, 2013 and one on April 22nd 2013 after they had installed some covers over the SFP (which has obviously been removed now). At that time they were cleaning debris and building the access platforms around unit 3 building. Both of those photos reveal a very deep gouge in the floor which is just to the north of the northwest corner of the SFP3, and that gouge is non existent in these new photos. At the same time other elements can be easily compared and correlated. This, in addition to the obvious manipulations that I pointed out earlier - indicates to me that the photos released and shown on this page are faked. The only way I would believe them is if they could be corroborated with other photos - satellite imagery or another overflight that shows the cap from various angles - thus not easily photoshopped - would be much more convincing that the several versions of the same perfectly flat view - easily photoshopped - that is shown here. I'm quite certain Tepco will not release any other photos, but anyone that has access to satellites can confirm or deny this story. I'm hoping somebody from one of the spy agencies will leak an actual satellite image. You can do this yourself; Blow up the photo - use CTRL C on your computer - right over the crane hook. Then use a ruler on the crane cables from the hook back up. The cables are displaced slightly at the edit point. The three on the upper side of picture are completely incongruent. 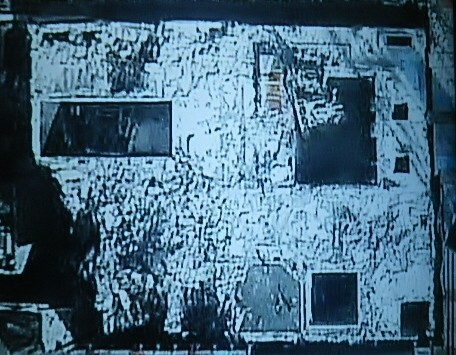 These photos are faked - Tepco what's really there??? James, TEPCO says it is a composite photo from several photos, as I wrote in the post. Pixelization most likely from "physical protection" requirement. 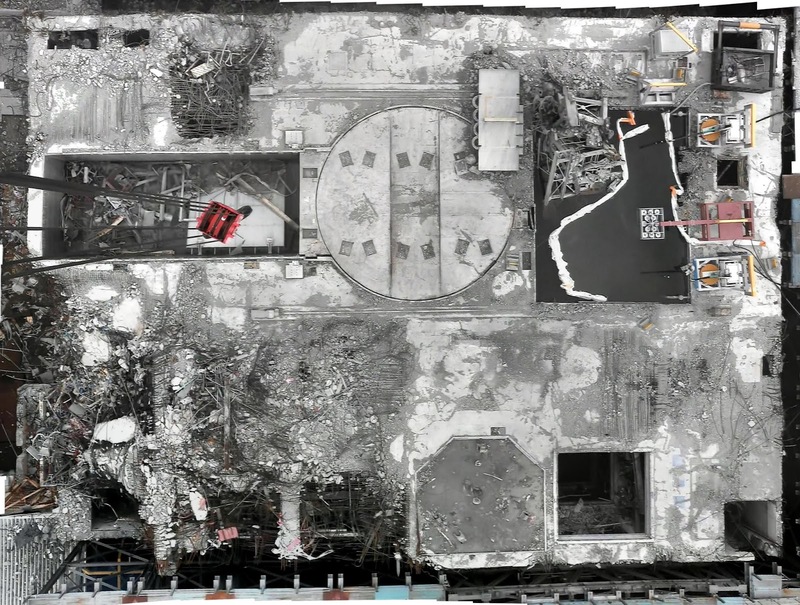 "The most severe damage, on concrete floor at least, is not seen near the shield plug or the Spent Fuel Pool on the east half of the operating floor but in the northwest corner (bottom left in the overall photo, or in the video showing the entire floor in the beginning). I wonder what was there (or the floor below)." I think the most likely answer to your question on the northwest corner was "nothing much". The rest of the building has major structures like the reactor itself, the spent fuel pool and the handling pool plus all the support concrete for those structures. This means that they were more resistant to the explosion, and they had less free space for the hydrogen to accumulate in. The NW corner being more working/access space would mean the contrary, a naturally open area with fewer resisting structures. All subject to the natural variability of random explosions, of course. arevamirpal::laprimavera: You have been duped. Whether Tepco readily admits the photos have been doctored, or they want you to think they have not been doctored - they have. The video suffers the same discontinuity problems that the still picture has. It is a "cartoon" - apparently filmed in a studio. The video nor the photos are consistent with other previously released photos. Of course I do not know what the whole truth is - but what I do know is that these photos are not even close to it. The sound of the Reactor 3 explosion was dubbed in after the fact by a TV station. There does not appear to be any recording of the sound of the Reactor 3 explosion. The sound does not add any meaningful data to the issue. It is extraneous. Tepco wants me to believe that an object massive enough to bend the outer circumference upwards and the center downwards was not also destructive enough to crack the top tier largely and visibly?? Ok.
Tepco, taking FlexCrete capabilities to the next level. James and others like him, you are duping yourselves, and that's your personal choice. Don't foist that onto others. Methinks there are some here who are angry that another crappy photoshop job has been exposed. You see, even if you honestly believed the pictures were real - you would have to look at the things I point out and question the validity, given the numerous untruths that have been distributed by Tepco in the past. Noone who wants the truth would take me on without taking a hard look at the photos. The photos are fake folks. For Tepco to ask the world that an overhead crane's block and tackle impacted the plug shield with enough force to warp the plug's circumference without visibly cracking the top surface or gouging out significant chunks of crete is ludicrous. If they are saying the upward bend is symmetric, that's even more ludicrous. That type of shaping is only done in prestressed concrete, and it's highly doubtful the top tier of the plug was meant to have camber. Precast concrete can have stressed cables, but that much camber they're claiming would once again leave visible cracking. Hairline or more. Not likely part of its design. Imagery of the underside of the plug is what's needed. Recall the worker who cut the prestressed cables in Crystal River's containment dome in Florida and doomed the structure. Prestressed tend to be integral structures and once cables are cut the structure is doomed. James, you have your own agenda. Keep it. Don't force it to others by invoking "truth", which you don't have. Steel reinforced concrete was developed as a way to strengthen the pour by using the relatively more flexible steel as a skeleton, of sorts, as concrete itself is too brittle without it. You'll recall from the video of 3's explosion that there were a number of quite massive slabs of concrete blown quite high into the air. I am prepared to believe that an explosion that powerful could lift the shield plug and drop it back down into its slot a little out of alignment. That could bend the reinforcing steel enough to warp the plug top. Just don't ask to believe it was hydrogen that did it, right? "James, you have your own agenda. Keep it. Don't force it to others by invoking "truth", which you don't have." Help me out here.. what's my agenda again? A major company/industry doctoring pictures of a nuclear accident is OK in your book, then? A lot of it is baiting, James, wouldn't let it bother you. Of course, only Tepco would include pictures, make a big claim like plug warping, and not include many photos in closeup of the top surface and the entire rim. I want to know about how some TV station dubbed in the sound track to Unit 3 exploding. The original embedded 'MediaInfo' says it was recorded in stereo at the same time the video was created. Another vast right wing conspiracy? Witnesses in the area said the sounds from the explosions were tremendous and the ground shook, miles away. The sound track from the Unit 3 explosion is more reveling than the video. Three large explosions in succession. Probably: Hydrogen lighting off first, second the reactor blowing its hot wad out its glowing red bottom and third the primary containment shell blowing apart turning the lower floors into rubble. All three explosion feeding into the plume making it grow larger from the inside out. The fourth sound you hear in the video, sounds like the trolley beams hitting the deck and the shielding plug. Like TEPCO, if you can't hide the obvious, at least created doubt. "All three explosion feeding into the plume making it grow larger from the inside out." The first explosion is obviously hydrogen with the flash and its horizontal expansion characteristic being similar to Reactor 1's. Reactor 1 blew out wall panels, but you didn't see huge slabs of concrete with protruding rebar sailing thru the air. You also hear 3 sounds near the end of the explosions that sounds like a burping sound. That's probably the recording equipment's transducing of a sudden vacuum effect that the equipment is sensitive enough to pick up. The atmosphere can communicate such locale-based information quite well at times. It's probably got some significance in its brevity and position in time relative to the explosion evolution [vacuum effect/recording equipment artifactt]. Finally, for those still attempting to say it was a hydrogen explosion, only. Does the military's hyperbaric fuel-air explosives pulverize concrete the way was seen in 3 but not in 1? If you were to pulverize the shield plug which is still intact it would almost certainly not be the color of the pulverized concrete that was on 3. The discoloration needs to be explained by something other than new properties of hydrogen explosions. The 12 rectangles you see on top of the plug, they must be grapple holds that they grout over after replacing the plug? I'm having a good laugh reading the conspiracy theory message above. So you guys really continued to believe there was an explosion inside the reactor, despite the fact a major part of the plug was clearly visible in the photographs about the steam months ago ? The good thing about those picture is that now what happened with the steam incident is much clearer now. The plug is supposed to be air tight, so I really wondered how water could get inside. But now it's clear the steam was rising from the area at the junction between the damaged and undamaged part. So the damaged central part is letting some water get inside, than then heats in contact with the inner concrete, and then comes out as vapor sometimes. Thanks, dude, that was an incredibly incisive insight for steam generation. We now know who the grillmaster of Burgers of No Thing is. Actually jmdesp, the thermal plots are more consistent with the leakage problem being at one end of the gate to the DSP, and indeed that concrete block is shifted in just the way that might bring about the problem. Of course cracks and damage to the shield plug might contribute also. The shield plug is not made to be air tight or water tight. In a vacuum event, nothing would happen to it. Its main purpose is to cover and fill a hole in the floor. Heat during the meltdown would travel with the fuel creating it as it sloughed to the bottom of the reactor vessel and offgassing pressures would blast it out the bottom of the weaken red hot reactor vessel bottom all at once, Certainly not a drip, drip event when water goes missing. How do you have steam creation inside a red hot reactor? The melt might find some water waiting in the primary containment bottom but it would have to blast out or melt out of the pedestal area first. Of course the access hatch to Unit's 3 was blown ajar. Does that mean anything? It's quite likely the shield plug was formed in 3 successive pours of concrete with massive rebar protruding up into the next stage's pour space as is common with elaborate structures. That requires Tepco's impact block & tackle or w/e to not only depress the center but also rip the circumference free of lower layers' rebar, and to show precious little signs of that impact. What is most likely is whatever explosion that jmdesp thinks didn't occur was forceful enough to actually lift the plug and there was so much sh*t flying around, steel, etc., that the plug could not fit fully down into its slot again because of obstruction or destruction of parts of the slot itself. The plug does appear to be vertically aligned: this is ideal for Tep as it allows clowns to refute all possible explanations other than the most droll Tep-prerogative-type explanations. That's what is known as jmdesp's Exposition: "I, jmdesp, work for a corp. that encourages its barely-employed employees to cut-up, to antic, for my dime." jmdesp's fellow barely-employed employees exchange glances of pseudo-affirmation, slaps on the back, expressed intention to rub elbows into the future, and end up convincing each other that "Life is Good.". Note that they incinerated uranium waste like Rocky Flats. Joffan, you are a master of words dude. "leakage problem" - to describe what's happened at #3. Sounds like it's just a flesh wound. You and grillmaster should open a PR company together. Challenger just had a "leakage problem" in the external fuel tank. Titanic had a small water "leakage problem"
JFK had a small "leakage problem" in his head after he got shot. That dark line is the gap between the plug and the surrounding floor, probably a few inches wide and a few inches deep and is typically not just concrete....an angle iron type edge would be there to maintain a good edge and keep pieces of concrete from falling off as the cap is removed and reset (often called an imbedment plate) , this area would need to be inspected for integrity after the accident....so it was cleaned off. And did you miss the part where it is stated that the photo is a composite of many smaller photos stitched together...look at the top and bottom of the picture, see how its jagged. that tends to lead to some discrepancies between frames due to varying focus and light source angle. relax a little, your trying to hard to find some conspiracy here. I have been on site collecting evidence after a very large object has fallen on concrete of this type.....I was surprised to see how much the epoxy floor covering flexes during these events. 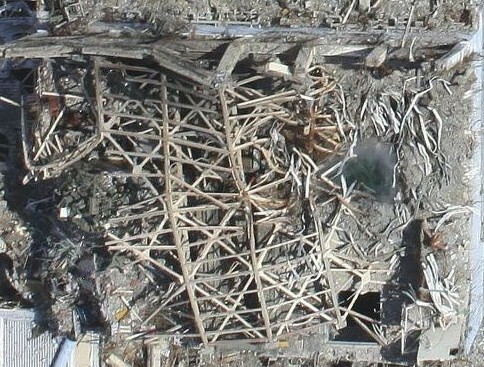 in one case a 500 ton component and supporting beams of many tons each fell....pushing the floor down about 6 feet in that area.....from 25 feet overhead you couldn't see any cracks, hell you could hardly see the bow of the floor. only when walking in that area did I later see cracks. the block for a containment crane is HUGE in comparison to what is typically seen by the general public....I have no idea what they weigh...but its a lot i am sure. did everyone miss this part of the text??? "(click to enlarge; composite photo from several photos, "
of course there are mismatches and some differences in the pic....let me see you stitch 30 or more photos together perfectly....and how would you do that....maybe..HMMMMM Photoshop! egads! relax people...quit trying so hard to find a cause, go downtown and volunteer at the foodbank or something worthwhile....your talent is wasted arguing about this on the internet. as fulfilling his wish for an angled shot of the top of unit 3 , even though at a slightly earlier stage of clean-up. 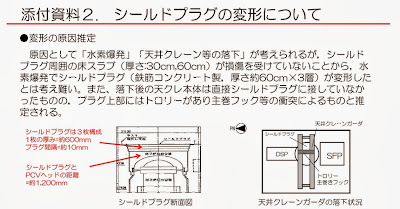 Once again, only TEPCO would exercise the prerogative to not include close-ups of the plug shield top and edges. "I have been on site collecting evidence after a very large object has fallen on concrete of this type [really?, Got specs?] .....I was surprised to see how much the epoxy floor covering flexes during these events. in one case a 500 ton component and supporting beams of many tons each fell....pushing the floor down about 6 feet in that area.....from 25 feet overhead you couldn't see any cracks, hell you could hardly see the bow of the floor." As they say in certain quarters of the internet, "vids or it never happened". Don't tell me, while rifling through your memories of the event your re-constructive memory alighted upon the moments where incident illumination supported your fantastic interpretation of the possible, and as you have a certain reputation for generating "skits" you chose the most unlikely for presentation to the others? aka, your "schiz-" function? That would be like the DOE's essential ambivalence in the WIPP's panel roof collapse incident as they intended to essentially do a collapse at the end to seal it again for supposedly another 250 million years? Our air-containment hope did not pan, so now we [DOE] must "put the salt to the info", is it? The pics could be real or fake. No way to tell as they have covered themselves by stating it is a composite photo. We are left to fight over smaller issues that are conveniently placed on the agenda by the very actors we are distrustful of. Which, of course and by design, divides us and leaves us focused on ego driven arguments rather than just accepting there will always be a wide range of possible explanations and interpretations of the minute when released info from govt/TEPCO sources cannot be trusted. I try not to loose sight of the fact that we are facing an ongoing, global, disaster that could have been prevented if not for the greed and connivance of our elected officials. Those officials and their supporters are the only people who would still be following and reinforcing the official line and not be struck by the insane hypocrisy of their arguments as revealed from earlier attempts by the govt/TEPCO to muddy the waters. "There was NO melt-down at FNPP" according to TEPCO for days, if not weeks, after they knew it wasn't true.